It was sad to leave Alpana Station. 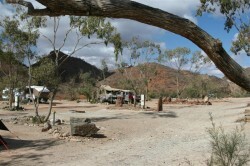 There are two roads to Arkaroola – one through Leigh Creek (on the highway) and a short cut from Blinman. After the rain, we were a little dubious as to whether we’d tow the van through the slippery mud bits, but trusted the local’s advice that everything would be fine and it was. The first 40 kms were very pretty, and then it was evident that, once over the ranges, there has been very little rainfall. We counted the creek crossings and gave up at 100! 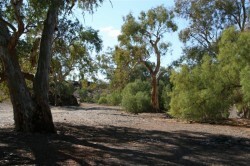 We called in at Chambers Gorge – little did we know that you are basically driving up the creek bed for 9 kms! Towing as well, but all was well and we had an early lunch, crisping up our homemade rolls again, but with every other tourist interested in our Kimberley Caravan, it wasn’t exactly peaceful, but enjoyable just the same. The countryside changed from healthy looking shrubs and trees, to gibber plains and dead trees. Unsure whether to stay un-powered at the Gammon Ranges, or do the extra 30 kms to Arkaroola, we decided to go for the soft option again and we were both pleasantly surprised with the massive improvements made (over the last 35 years!!!). Quite a few spindly trees, leveled and landscaped sites, fire pit and plate on each site, septic toilets, a reception area with a restaurant, bar and shop, and fuel at $1.55 a litre. 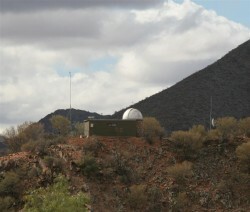 From our camp site we can see the Observatory on a nearby hill; it contains a 360 mm (14″) telescope to view the southern sky. We just enjoy looking at the night sky while sitting around our fire. Apparently, we missed a meteor shower that happened on Tuesday night – Wednesday morning 1.00-3.00 am. very engaging and also the blog post was a remarkable read.